The idea to paint this work came to me all at once. I went from conceiving the idea to having the full sketch done on my computer in a couple of hours. It came at a particularly spiritually heightened time in my life as well. During a time I had been meditating and doing dietary cleanses. Luckily, I already had a backlog understanding of the symbolism I wanted to use to create the meaning (got that MA in Art History way back…), so it was really just coming up with the composition and choosing how to put it all together. 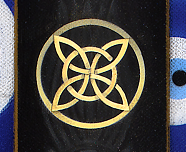 I was challenged by some of the technical aspects of creating certain symbols. I’m still in my first year of learning to paint and I spend a lot of time inventing and reworking. But overall I’m getting faster and more confident in my process. Many may not know the significance of the Hamsa or the many symbols in this painting, so I wanted to provide some commentary on the piece. Hope you enjoy this painting as much as I enjoyed the meditations, research, and process of creating it. 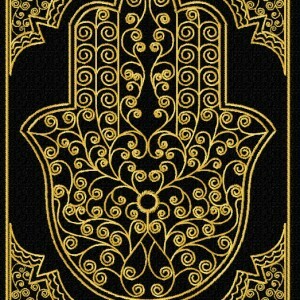 The Hamsa is a centuries old symbol, used in Christian, Islamic, and Judaic cultures for protection or warding. 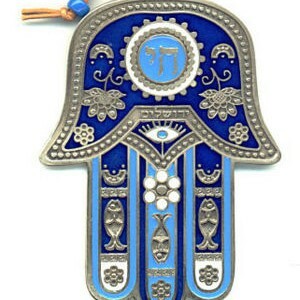 Hamsa, which is Arabic for “five,” is a depiction of the open right hand, which is a near universal gesture or sign of protection and blessing, and seen represented in the art of many cultures and ages. 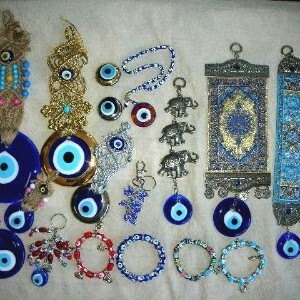 Used in the Hamsa, it’s purpose is to ward the evil eye, curses, or hexes. 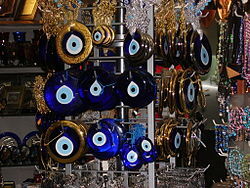 As such, the Hamsa is often depicted in jewelry, portable trinkets, tattoos, and art hung near entrances of the home or business. 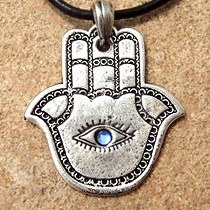 I wanted to make a super heavy duty extra powerful Hamsa that I could put outside my door–or wherever–and it would really work. 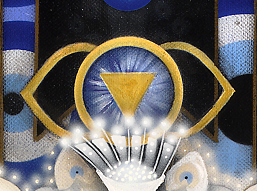 So I wanted to load it with as much protection energy as I could–through symbols, colors, composition, intention–and really make it functional. 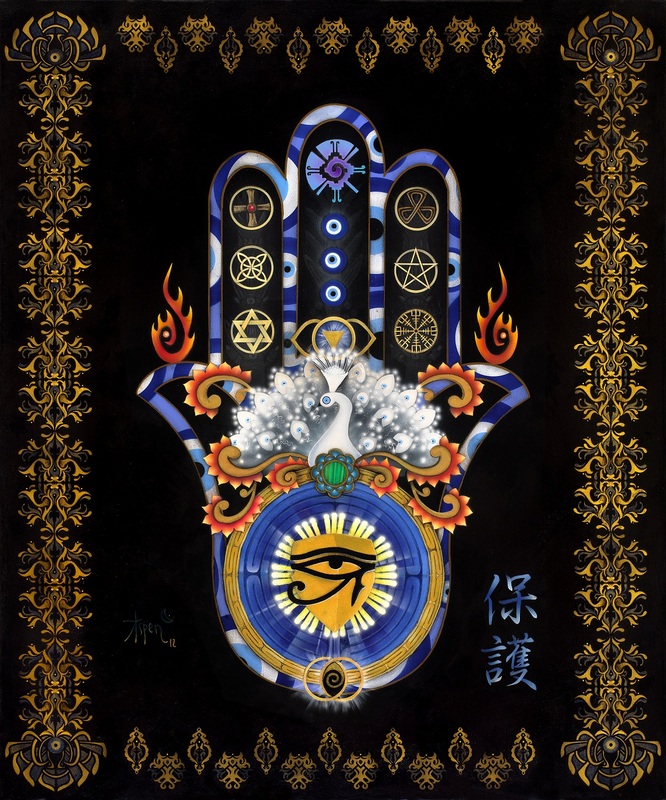 Behind the black background are 72 nazar, which work energetically behind the scenes and peer through the black to create the form of the hamsa. There are an additional 88 nazar bordering on the outside rim of the canvas–in other words nazar looking every direction. The symbols on the fingers are also protection symbols from various cultures and ages–from the Christian cross to the Norse Helm of Awe, which soldiers would inscribe in blood on the inside of their helmets above their eyes. The peacock represents authority and majesty over the universe, God/Goddess, all the stars in the Heavens and beyond. 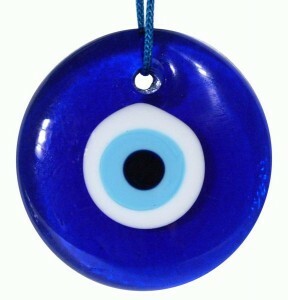 With its many eyes and all-seeing omniscience, it watches over and protects. But it also nurtures and defends us throughout life. The peacock sits below the symbol for the third eye chakra, which is the conduit to consciousness through life’s journey, represented with the Mayan Hunab Ku symbol. The peacock overlooks a labyrinth which represents our life’s journey. 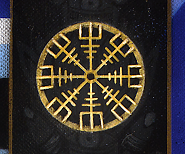 It is surrounded by an ancient Mesoamerican symbol called the pathway of the sun, which is the gold border around the labyrinth and represents time and the finite nature of our journey. 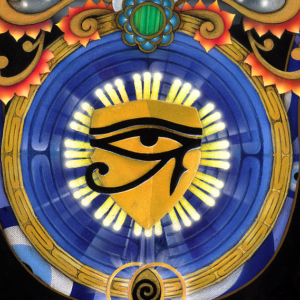 The Eye of Horus and the shield, as additional protection symbols also watch over the labyrinth as the sojourner walks life’s journey toward the center, and ultimate potential. 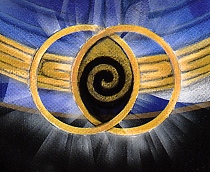 To begin life’s journey, we each need the help of two others, to create the portal of becoming–of dimensional being–which is the portal of the spiraling vesica piscis created by two magical beings coming together to open the magical portal into life’s sojourn. This portal sits right at the entrance of the labyrinth. Flame sentinels and the beautiful Asian kanji for protection enliven and brighten the protective energies and broaden their universal context. Overall the piece is my attempt to create an image that is not only beautiful but universally functional in a positive way. We’re living in tough times and sometimes we forget how much protection we really need. But I think we also forget that we’re being watched over, that there are intelligent forces at work–protecting us from all the evil forces, our foes and nemises, and even ourselves. 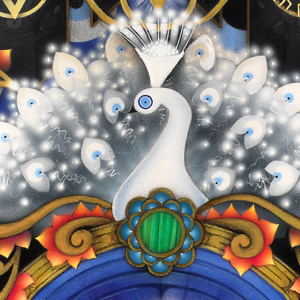 In addition, I wanted to create a new artistic representation of a classic idea which celebrates the rich tradition and history not only of the Hamsa, but all the many symbols people ascribe power and intention to. Symbols are a beautiful language many of us know subconsciously or instinctively, but not necessarily on a conscious level. Nevertheless, a symbol can be more powerful than millions of words and can transcend spoken language, culture, gender, ethnic identity, religion to communicate at the level we all understand–the human level.